Edel Assanti is pleased to present Haven Her Body Was, a solo exhibition of Noémie Goudal's latest series. Noémie Goudal's Haven Her Body Was explores the relationship humanity develops with secluded landscapes such as islands, grottos or shelters. The images isolate spaces equivalent to those classified by Foucault as 'non-lieux': places revealing gaps or distances between irreconcilable sites or elements, inducing confrontations between the real and the articulable. In these scenes, frequently staged by the artist across varied geographies, but sometimes revealed as they were discovered in the world, reality and its representation become scarcely discernible. As in her previous series, Les Amants, Goudal employs the methodology of insinuating meaning through contrasting the artificial and the organic, and bringing to surface the underlying tensions between these opposites. The series, uninhabited yet implying human presence, intimates an underlying shared narrative cleaving the individual works together. Through the interweaving of the real and the constructed, the works become gateways to make-believe worlds, invoking Goudal's underlying interest in storytelling. often employing the use of photographic backdrops or synthetic materials parodying those of nature, these works beckon the viewer to suspend their knowledge of the image as a constructed fiction, and imbue them with their beliefs and fantasies. Whether a lush jungle wilderness within an industrial warehouse, or a solitary iceberg sublimely floating on a still seascape, goudal's visual worlds embody an escape, not just from the contemplative universes in which they exist, but also from the reality of space and time in which the viewer resides. The exhibition is accompanied by a publication with an essay by Emma Lewis and Sebastien Montabonel. Noémie Goudal graduated from the Royal College of Art Photography MA with distinction in 2010. Her work has been published in the British Journal of Photography, hotShoe, Vogue and Creative Review. Goudal's work is in major international collections, including the Fotomuseum Winterthur, Saatchi gallery, the David Roberts Art Foundation and the Conran Art Foundation. 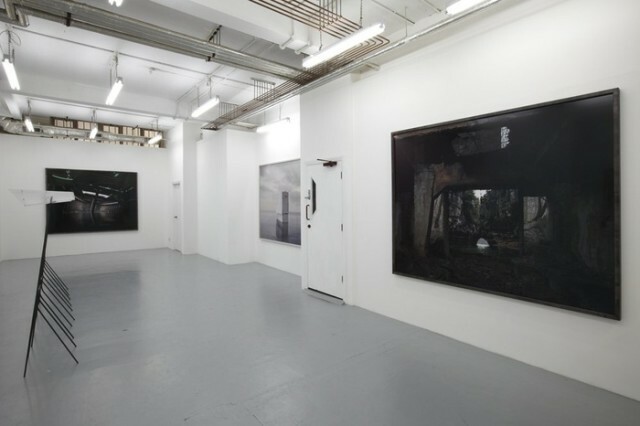 Goudal's works were exhibited in Saatchi gallery's 'out of Focus' photography survey exhibition in london in 2012, and was runner up for the 2012 Paul Huf award at the Foam museum, Amsterdam.